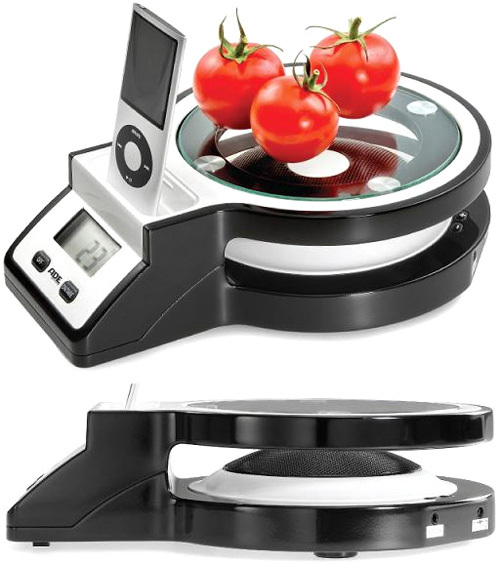 Frieling JOY Kitchen Scale With A Built-In iPod Dock – Sure, Why Not? | OhGizmo! Frieling JOY Kitchen Scale With A Built-In iPod Dock – Sure, Why Not? By Andrew Liszewski on 04/04/11 • Leave a comment! I guess there’s nothing wrong with a little background music while cooking, and no one likes a unitasker in the kitchen, so Frieling, makers of some clever kitchen scales we’ve brought you before, have recently introduced the JOY to their lineup. As kitchen scales go it’s pretty run of the mill with the ability to display weights in ounces or grams, but in terms of design it scores some high points. The weighing surface is made of stylish, see-through safety glass which exposes a fairly large speaker sitting underneath. I’m a little worried about food stuffs dripping down below though, or into the iPod/iPhone docking port, and it looks like it gobbles up quite a bit of counter space when not in use. But if your kitchen is the center of high-techery in your home, you can get one from Amazon for $99.99.